Larysa Petrivna Kosach-Kvitka (February 25 [O.S. February 13] 1871 – August 1 [O.S. 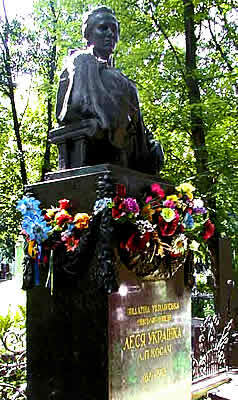 July 19] 1913) better known under her literary pseudonym Lesya Ukrainka, was one of Ukraine's best-known poets and writers and the foremost woman writer in Ukrainian literature. She also was a political, civil, and feminist activist. Lesya Ukrainka, pseudonym of Larisa Petrovna Kosach-Kvitka (born Feb. 13 [Feb. 25, New Style], 1871, Novograd-Volynsky, Ukraine, Russian Empire [now Novohrad-Volynskyy, Ukraine]—died July 19 [Aug. 1], 1913, Surami, Georgia, Russian Empire [now in Georgia]), poet, dramatist, short-story writer, essayist, and critic who was the foremost woman writer in Ukrainian literature and a leading figure in its modernist movement. The daughter of intellectuals, Ukrainka was stricken with tuberculosis in 1881 and traveled widely thereafter in search of a cure. Her early lyrical verse, influenced by Taras Shevchenko, dealt with the poet’s loneliness and social alienation and was informed by a love of freedom, especially national freedom. 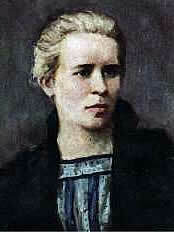 The collections Na krylakh pisen (1893; “On the Wings of Songs”), Dumy i mriyi (1899; “Thoughts and Dreams”), and Vidhuky (1902; “Echoes”) established her as the leading young Ukrainian poet of the day. She was active in the Ukrainian struggle against tsarism and joined Ukrainian Marxist organizations, translating the Communist Manifesto into Ukrainian in 1902. In 1907 she was arrested and, following her release, was kept under observation by the tsarist police. She married the court official Klyment Kvitka in 1907. Ukrainka concentrated on poetic dramas from about 1906 on. Her plays were inspired by various historical milieus—e.g., the Old Testament in Oderzhyma (1901; “A Woman Possessed”) and Vavylonsky polon (1908; The Babylonian Captivity), the world of ancient Greece and Rome, the early Christian era in U katakombakh (1906; In the Catacombs) and Na poli krovy (1911; “On the Field of Blood”), and the medieval period. Folk songs and fairy tales provide the framework for Lisova pisnya (1912; Forest Song), in which Ukrainka reflects on the timeless tension between exalted ideals and sordid reality. Her historical drama Boyarynya (1914; The Noblewoman) is a psychological tragedy centring on a Ukrainian family in the 17th century. Ukrainka also wrote short stories and critical essays and did masterful translations of works by Homer, William Shakespeare, Lord Byron, Victor Hugo, and Ivan Turgenev. In 1893 at age eighteen Lesya Ukrainka published her first book of poems in Ukrainian, On the Wings of Songs. She was not allowed to publish it in the Russian Empire, and instead had it published in Western Ukraine which was then under the Austro-Hungarian Empire. Risking her life, she had the book smuggled into Kyiv. Lesya Ukrainka is the literary pseudonym of Larysa Kosach - Kvitka, who was born in 1871 to Olha Drahomanova-Kosach (literary pseudonym: Olena Pchilka), a writer and publisher in Eastern Ukraine, and Petro Kosach, a senior civil servant. An intelligent, well-educated man with non-Ukrainian roots, he was devoted to the advancement of Ukrainian culture and financially supported Ukrainian publishing ventures. In the Kosach home the mother played the dominant role; only the Ukrainian language was used and, to avoid the schools, in which Russian was the language of instruction, the children had tutors with whom they studied Ukrainian history, literature, and culture. 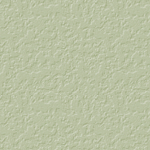 Emphasis was also placed on learning foreign languages and reading world literature in the original. In addition to her native Ukrainian, Larysa learned Russian, Polish, Bulgarian, Greek, Latin, French, Italian, German, and English. A precocious child, who was privileged to live in a highly cultivated home, Larysa began writing poetry at the age of nine, and when she was thirteen saw her first poem published in a journal in L'viv under the name of Lesya Ukrainka, a literary pseudonym suggested by her mother. As a young girl, Larysa also showed signs of being a gifted pianist, but her musical studies came to an abrupt end when, at the age of twelve, she fell ill with tuberculosis of the bone, a painful and debilitating disease that she had to fight all her life. Finding herself physically disabled, Lesya turned her attention to literature - reading widely, writing poetry, and translating. She shared these literary activities with her brother Mykhaylo (literary pseudonym: Mykhaylo Obachny), her closest friend until his death in 1903. When Larysa was seventeen, she and her brother organized a literary circle called Pleyada (The Pleiades) which was devoted to promoting the development of Ukrainian literature and translating classics from world literature into Ukrainian. As a teenager, Larysa's intellectual development was further stimulated by her maternal uncle, Mykhaylo Drahomanov, the noted scholar, historian and publicist. He encouraged her to collect folk songs and folkloric materials, to study history, and to peruse the Bible for its inspired poetry and eternal themes. She was also influenced by her family's close association with leading cultural figures, such as Mykola Lysenko, a renowned composer, and Mykhaylo Starytsky, a well-known dramatist and poet. Lesya published her first collection of lyrical poetry, Na krylakh pisen' (On Wings of Songs), in 1893, a year after her translations of Heine's poetry, Knyha pisen' (The Book of Songs) appeared. In the Russian Empire, Ukrainian publications were banned; therefore, both books were published in Western Ukraine and smuggled into Kyiv. In addition to her lyrical poetry, Ukrainka wrote epic poems, prose dramas, prose, several articles of literary criticism, and a number of sociopolitical essays. It was her dramatic poems, however, written in the form of pithy, philosophical dialogues, that were to be her greatest legacy to Ukrainian literature. Only one of Ukrainka's dramas, Boyarynya (The Boyar's Wife) refers directly to Ukrainian history, and another, an idealistic, symbolic play, Lisova pisnya (Song of the Forest), uses mythological beings from Ukrainian folklore. Her other dramatic poems issue from world history and the Bible. With their sophisticated psychological treatment of the themes of national freedom, dignity, and personal integrity, they are a clarion call to people the world over to throw off the yoke of oppression. In 1901, Lesya suffered a great personal loss - the death of her soul mate, Serhiy Merzhynsky. She wrote the entire dramatic poem Oderzhyma (The Possessed) in one night at his deathbed. A few years later, in 1907, she married a good friend of the family, Klyment Kvitka, an ethnographer and musicologist. It was he who transcribed and published the many Ukrainian folk songs that she had learned as a young girl in her native province of Volyn. Despite many prolonged periods in her life during which she was too ill to write, upon her death in 1913, at the relatively young age of forty-two, Ukrainka left behind a rich and diversified literary legacy. While it is the deep philosophical thought and the perfection of her poetic form that have assured her a place among the luminaries of world literature, her prose works, which she continued writing throughout her literary career, provide a fascinating insight into the inner life of this gifted, multifaceted writer, and reveal her perceptions of the multi - layered society in which she lived. Thoughts, away, you heavy clouds of autumn! For now springtime comes, agleam with gold! All the tale of my young years be told? I want to live ! You, thoughts of grief, away! I'll pour bitter tears on them as dew. Singing springtime for me, too, some day. Song I'll sing, a song of joyous praise. She that reigns bright mistress of dark skies. I shall live ! You thoughts of grief-away ! * Line 11 is ambiguous. If " morozi " is taken to be the prepositional case not of " moroz, " but of " morih, " the line should be translated :" I'll sow blossoms, on the greensward spilling, "